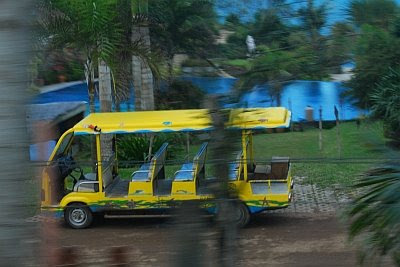 Right after leaving the grounds of Silangang Nayon Park and Restaurant, Tutubi requested his driver to turn left towards the end of the road going to the private resort with membership that saw from a distance with jet skiis and people frolicking on the water. a guest accommodation of the resort. 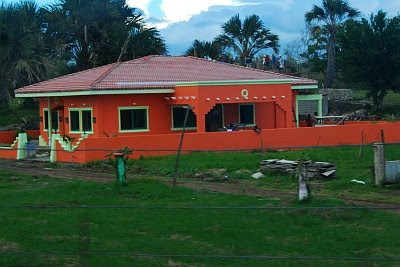 Note that the others are painted in a different color making the whole resort quite colorful. Too bad, trees obstruct the view from passers-by, good for privacy though. Please dial Pueblo Por La Playa's Contact number at +63.42.716.0072 for your inquiries. 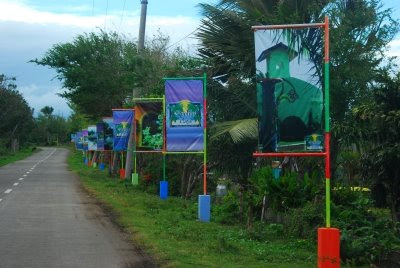 This resort was featured on Kapuso Mo Jessica Soho's Summer Special episode on April 4, 2009. If you're looking for driving directions to Pueble Por La Playa, it's just about a kilometer from Silangang Nayon Park and Restaurant, click the link for the details. 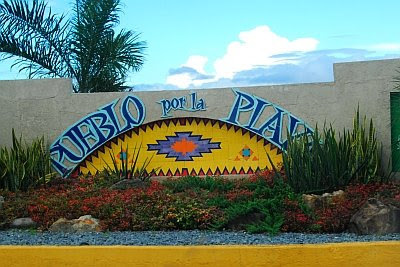 Please visit Pueblo Por La Playa's official website or call telephone number for details, inquiries, entrance fee, day tour rates and room rates, promo packages and other information. I so much agree with r-yo; you really write well, give a good review and give great pics. Thanks for taking us with. Nice resort.. is there a golf course too? A 9 hole course would be nice. It looks really neat - the resort! Looks like a pretty nice place. Is the resort open for non-members? mi familia want to spend a weekend there for this summer..is this possible? I've been there last 2007 with some friends. We enjoyed the place. I tried their kayak for the 1st time and it was fun! I'll be there again tomorrow with my family ! I've been there last 2007 with some friends. I tried their kayak for the 1st time and it was fun! I'll be back with my family tomorrow! hello,somebody help me.i want to visit this place on dec with my fmily but the problem is im not a member.im working here in israel as a cregiver and planning to have my 1st vacation to my country and i want to spend some of my time resting to this place.this is my email add calla_29@yahoo.com hoping for a short answer.tnx a lot. we had been there this weekend.. they are allowing 1st time visitors for non-members.. there's just an additional charge for the food.. a really great place and i very much liked the services.. you may call their office for inquiries and reservations, or visit their website..
how much ang room rate dito per night? First time To go There ? i've been in pueblo last year. the place is so amazing!